My guess is that every one of my readers has heard of a motorcyclist who was injured or killed when someone turned left in front of them and a collision resulted. That left turner was always the 'bad guy', right? But surely you, like all the rest of us, have made left turns with our vehicles and we would never cause such an accident - because we remain alert, drive defensively, and maintain 'situational awareness'. And we discover that we have just KILLED A MOTORCYCLIST! How can that be? We did everything right! We were not speeding, not drunk, not talking on a cell phone ... but there lies a dead motorcyclist and you can be absolutely certain that we will get a day in court to explain why we killed him. Especially after we say "I didn't see him!" Well, let me give you a hint. 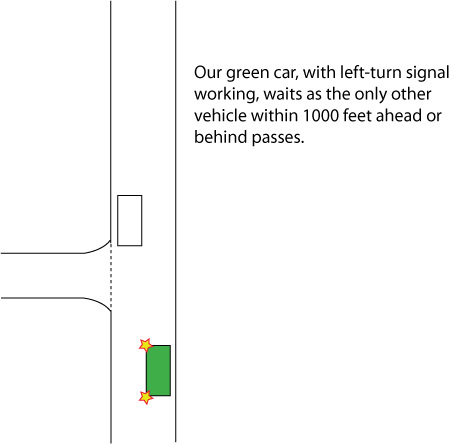 You would expect, I'm guessing, that the motorcyclist crashed into the passenger side of our green car because, after all, we have crossed over almost the entire oncoming lane. But you would be wrong as what actually happened is that the motorcycle hit our LEFT-FRONT bumper. Have any other thoughts now? Oh, he hit us at 40 mph, the legal speed limit. That is, he had not been traveling at 100 mph and just appeared out of nowhere - there was 1,000 feet of unobstructed visibility both ahead of and behind us. What I will demonstrate for you here is that motorcyclists MUST drive defensively. Part of defensive driving is a concept called 'conspicuity' - visibility. That does not simply mean 'drive with your headlights on', and it does not simply mean 'wear light colored and/or reflective clothing'. It means 'SEE' and 'BE SEEN'. In this particular scenario there is only one possible way for the accident to have happened - the motorcyclist really was not visible to us. Observe that from our perspective (driver of the green car), there is no motorcycle or any other traffic in the oncoming lane other than the white car. This has been true since the white car first became visible to us when it was over 1,000 feet ahead. The white car obscured our sight lines. Then, as the white car began to pass us, that 'A pillar' began to obstruct the motorcyclist (that metal column on the left edge of your windshield that supports the roof and windshield). Now let me ask you, "Why did the motorcyclist hit our left-front bumper instead of the passenger side of our car?" Again, you know the answer to that question. New riders who have not, through practice, internalized the concept of counter-steering and use it instinctively, tend to NOT use it during a crisis. 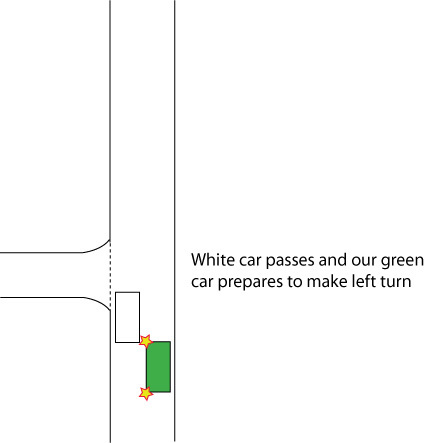 No rational thinking person would turn their motorcycles toward the front of a left-turning vehicle as in this scenario because that would result in hitting the vehicle at its front, AND being run over by the vehicle after the collision. They would, if possible, turn toward the rear of the left-turner. But new, inexperienced, riders - having forgotten everything they ever 'knew' or had heard about counter-steering, would try to turn their handlebars to the left and find that the bike 'fights them' - simply will not go to the left. In fact, the harder they try, the more the bike turns to the right. 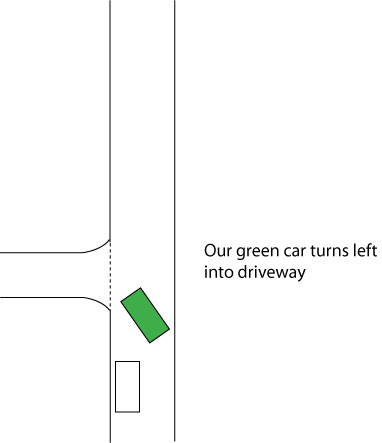 The result, a collision with the front of our green car instead of merely a close call.